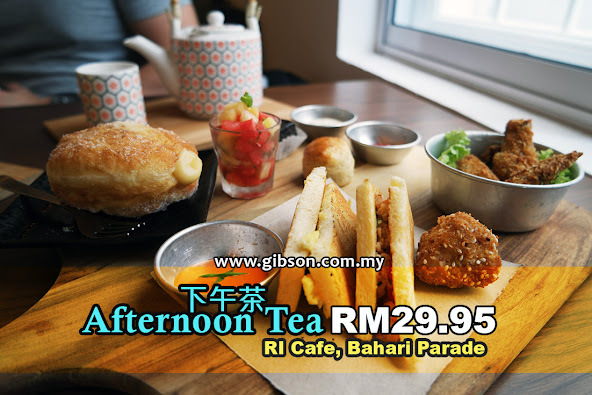 A new café in town, Ri Café is now offering afternoon tea at only RM29.95 per person, as they will be serving 8 types of savouries and sweets with a pot of tea. Gibson likes the idea of the afternoon tea that serves interesting savouries, instead just a set of overwhelming sweets. Please take note that the 4 savouries and 3 sweets are standard on the menu plus one option of 4 choices of a sweet that will be served depending on availability. Gibson was lucky enough to try all the 4 optional sweets, which are the Matcha tart, Banana Bread, Lemon Pound and Brioche Donuts, and the 4 sweets are labelled in the photos for your reference. Ri Café is like a secret garden in the heart of George Town, where you find peace and quiet in a crowded city. Gibson really likes the tea set here, ideal for a cosy yet elegant afternoon moment. They have a little outdoor space while both indoor and outdoor are well decorated with greenery. If you bring along your kids, there is a small playground. Most of the food here are prepared in-house, even the toast for sandwich is freshly baked here, so no junk food is allowed. This is the portion for 1 person afternoon tea set. Gibson likes the Breaded Chicken Wings that is covered with breadcrumbs for the savouries choices, even the breadcrumbs are in-house made, while most of the afternoon teas that are offered in town do not include wings in their menu. Hence, this is really a local touch to tea time. Address: 81, Bahari Parade, Jalan Sri Bahari, 10050, Georgetown, Penang. Business Hours: Tuesday-Thursday 9am - 6pm, Friday-Sunday 10am-10pm. Closed on Mondays. The price list presented here is as on 6th May 2017, the day when I visited the restaurant, They do not charge 6% GST nor service charge.